BUCHAREST, Romania --- General Dynamics European Land Systems (GDELS) has achieved an important milestone in the Piranha 5 Program for the Romanian Army with the completion of a successful live firing test in the presence of the Romanian procurement authority. The test occurred March 28,2019 at a firing range in Camp Rena (Norway). A fully-equipped Piranha 5 performed a series of static and dynamic shooting tests with a 30mm system in order to demonstrate its capability. The tests exceeded the customer’s requirements and qualified the ELBIT UT30MK2 system for the 8x8 wheeled armored vehicle for the Romanian program. In January 2018, and as part of the Romanian Army’s plan to modernize its legacy wheeled armored vehicle fleet, GDELS signed a contract with the Romanian Armed Forces to deliver up to 227 Piranha 5 wheeled armored vehicles in six different configurations. The modern Piranha 5 vehicles will be produced in Romania under a strategic cooperation and transfer of technology project between GDELS -Mowag and the Romanian company Uzina Mecanică București (UMB). Over the last year, and as part of the GDELS and UMB cooperation, GDELS and UMB have completed the first construction phase of the renovation of the UMB facilities. 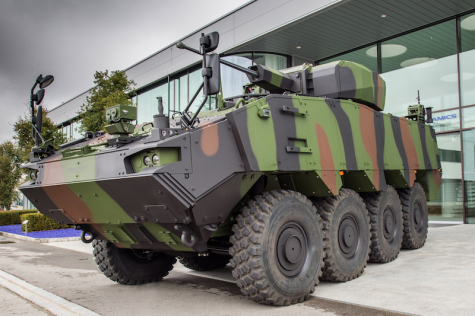 In addition, UMB Romanian employees were trained in Switzerland and have been finally qualified by General Dynamics European Land Systems-Mowag for series production of Piranha 5. As a result, the UMB facility and employees are ready for serial production to begin in Romania. “The Romanian Army is one of the most important Piranha users in Europe and has been a GDELS customer since 2006 with fielded variants of Piranha vehicles deployed in various missions in-country and abroad. Our collaboration with UMB will create a sustainable benefit to the Romanian economy and we are proud to support UMB in production and in proving our efficiency and reliability to Romanian Army,” said Oliver Dürr, Vice President Wheeled Vehicles and Managing Director of General Dynamics European Land Systems –Mowag. “In support of such an important customer and program, we are pleased achieve two important milestones with the successful shooting trials and also with the readiness of our partner UMB for local series production,” Dürr added. General Dynamics European Land Systems, headquartered in Madrid, Spain, is a business unit of General Dynamics and conducts its business through six European operating sites located in Austria, Czech Republic, Germany, Spain, and Switzerland. With around 2,300 highly skilled technical employees, the companies design, manufacture and deliver world-class land combat systems, including wheeled, tracked and amphibious vehicles, bridge systems, armaments, and munitions, to global customers.